“Winter had lasted so long that it seemed it would never end. 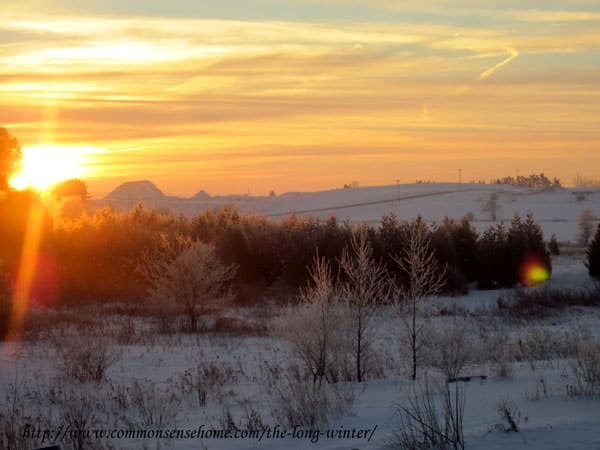 It seemed that they would never really wake up.” – from “The Long Winter” by Laura Ingalls Wilder. It may be old fashioned, but my youngest and I pile into bed and read together at bedtime. This winter we started working our way through the Little House series of books by Laura Ingalls Wilder. We've also started watching the TV series on the Hallmark channel. (Boy, what a difference between the books and the TV series!) Right now we're reading “On the Banks of Plum Creek“, but it feels like we're living in “The Long Winter“. Here in northeast Wisconsin (and in much of the U.S.), this winter has been one for the record books. We haven't had a snow pack this deep or temps this cold since I was a little girl, younger than my boys are now, back in the 1970's. I remember huge snow piles along the side of the road that were taller than a truck. We've got those again this year. Later this week, we'll set a record for days with temperatures below zero degrees Fahrenheit since they've been keeping track in this area. (We're at 45 days, with six more days in the forecast.) 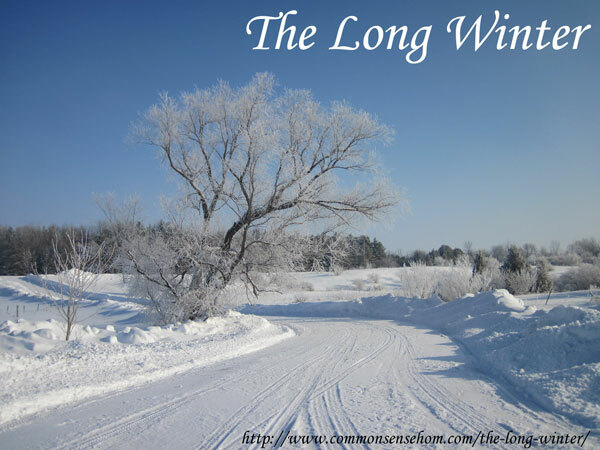 Thankfully, we're not quite as bad off as the winter of 1880-1881 from “The Long Winter”, and we have better snow moving equipment and supply lines. The heat exchanger died in our combination water heater/space heater unit, so for about a month we operated on partial heat. We got the heating system fixed just in time for the well pump controller to die – on a Saturday night. Good news – the septic hasn't frozen yet and neither have any pipes. Hopefully we've got enough snow over the drainfield to protect it, and the Insulated Concrete Form walls should keep the pipes safe. There have been weeks when we've stayed home, because the driveway kept drifting shut shortly after it was plowed. It's hard to explain to friends who live in the city that you simply cannot go places because you are literally trapped in your house. The driveway is several hundred yards long, and the banks on either side are as tall or taller than I am in many spots. 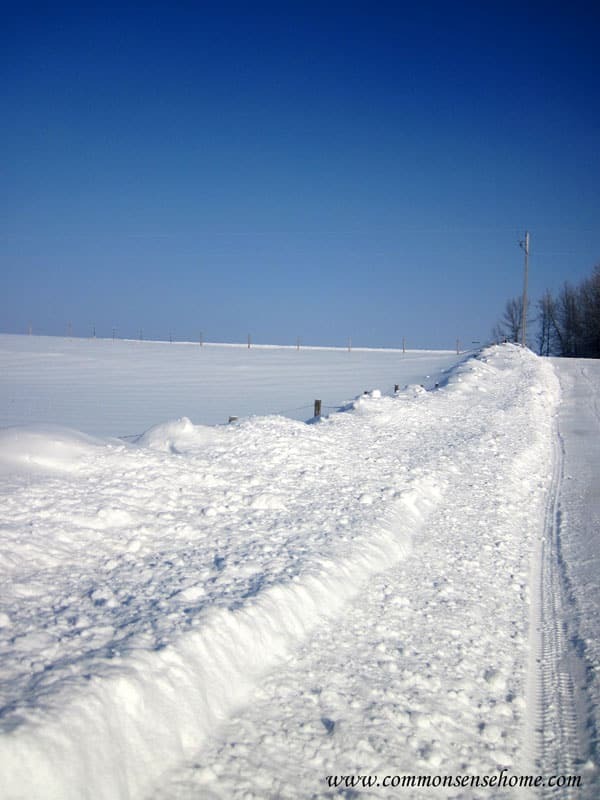 When spring comes, we'll be helping the neighbor repair his fence line, because it got buried under the snow from our driveway. You can see small sections of the top of the fence posts on the left side of the photo below, sticking out of the snow bank. Ronnie realizing just exactly how deep the snow is, and changing his mind about going out. Highbush cranberry (crampbark) in our yard. I stepped off these snow piles into the drifts, and sunk in up to my backside. 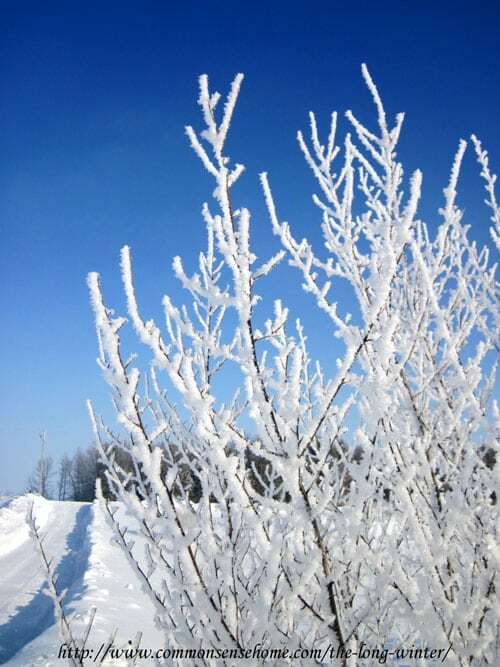 The hoarfrost was gleaming in the sunlight, coating every surface. Then the wind picked up, and in minutes, it was gone. Now there's less than a month of “official” winter left, but it looks like we've got plenty of cold weather and storms to come. I confess, I'm jealous of online friends who are posting photos with green grass and fresh strawberries already, but not quite motivated enough that I want to move. I'd miss my local friends and family too much. 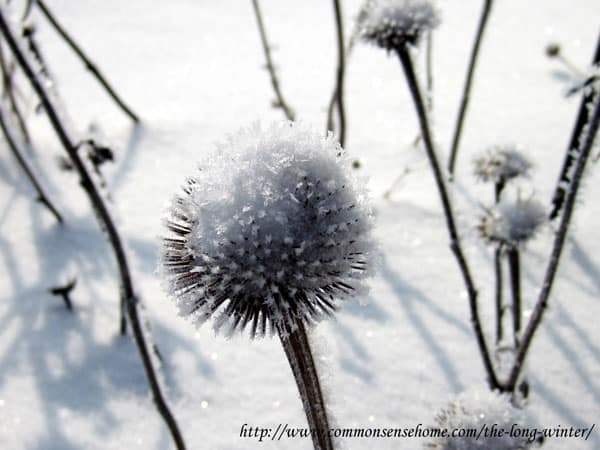 Stay safe and stay warm, and get those seeds started inside, because eventually spring will come, even here. 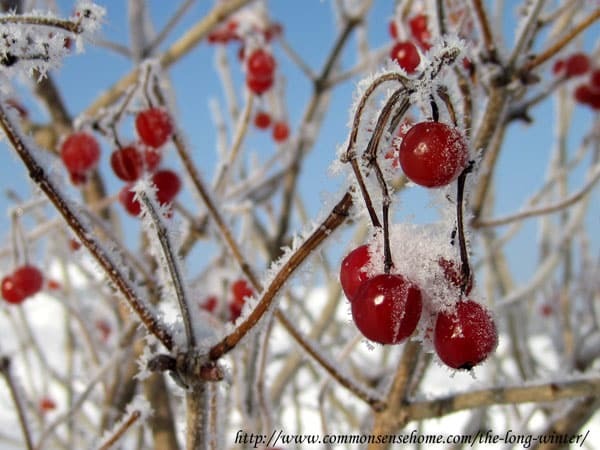 think of all the moisture for your garden beds??? trying to put a positive spin on it!! I hope you thaw out soon. I grew up in Michigan and remember the snow in the 70’s too. The ground is frozen so deeply that much will likely be lost to runoff, but hopefully the mulch will help. Maybe the deep cold will knock back the squash bug population? 🙂 I’ve got a greenhouse and cold frames – we’ll make it work! Thank you for the wonderful blog. Your pictures were so beautiful and made me more appreciative of this long snowy cold winter. I read your seed starting article and this has inspired me to get moving on what I have left over while waiting for my new seed order to arrive here in upstate NY. Thanks again! 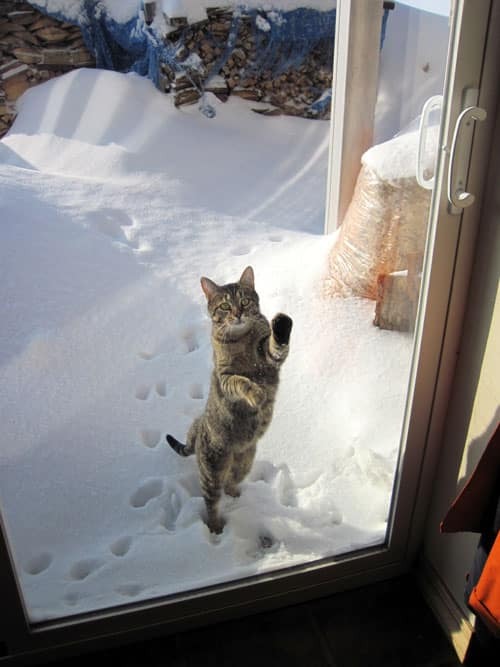 You’re welcome, and stay warm! It’s been a long winter (even for us in Wisconsin! )…LP shortages, frozen pipes, etc…. This deep cold effected the fish and wildlife as well. Fishing was way off from last year and I worry about the deer herd. Harsh winters have a tendency to cause a “die off” of parts of the herd. Not only do we lose deer but the lower number affect the local economies of small towns that depend on hunter traffic. On the plus side, snowmobiling was strong this year….again, helping local towns who depend on the traffic to make it through the year. I was wondering if snowmobile riding was high this year, or if the bitter cold was keeping people off the trails. I hope some of the wildlife that dies off includes garden pests. Whatever will be, will be. What a great post. It warmed me in ways that I find hard to explain. I think you have it “more wintery” than I do in Southeast Idaho but the short growing season & long, cold winters are similar in lots of ways. I absolutely love the photos you included & I appreciate your perspective. Thanks for a heartwarming read for me! You’re very welcome, Genene. Thanks for taking time to share your thoughts. What a beautiful post — made me homesick for Minnesota . . . Yes, it can be a struggle, but oh, the beauty, cozy, all safe and snuggled up in a warm house, well, that feeling can’t be beat! Spring will bring other challenges but the glorious bursting of green makes one forget winter and appreciate the rebirth of planet Earth (Wisconsin in particular). These times with your family are precious — goes so fast. It’s true – there’s nothing like deep cold to make you appreciate the warmth when it finally comes. I swear the years fly by faster and faster. Enjoyed the pics! Ironically, we had a very mild winter in Alaska with very little snow…. 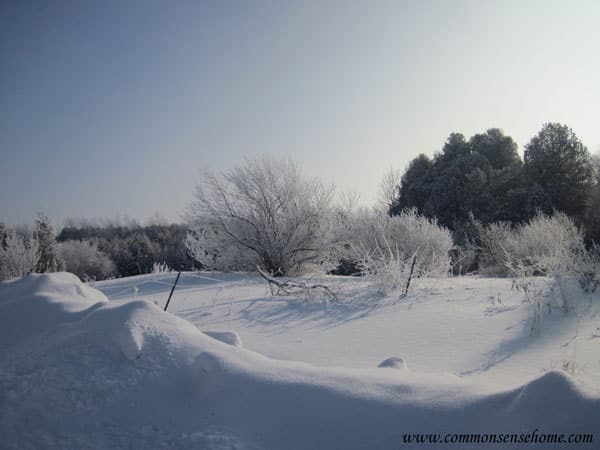 Say what you will about winter in Wisconsin….it’s home. After living in Saudi Arabia for 18 months, I wouldn’t trade our winters for anything! A struggle? sometimes….but the people are friendly and there is alot to be said for witnessing the changing seasons! 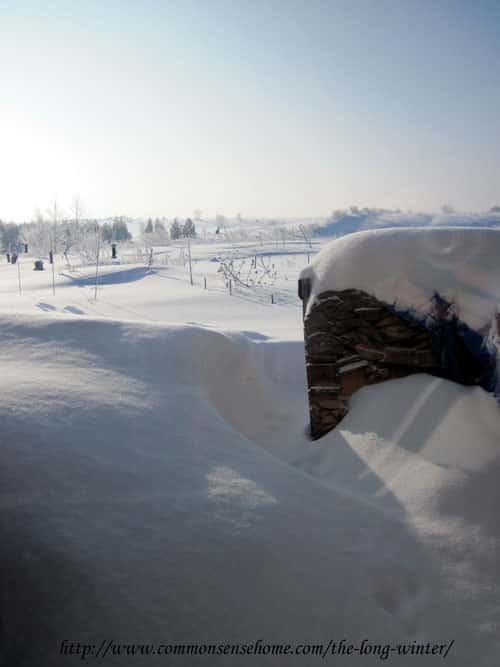 I was looking at my gardening slide show from 2011 on the Gardening Page, and sure enough, big snow on April 20th. At least this cold should knock back some of the troublesome bug populations.